Tuvia Ruebner is one of the last major Israeli poets of his generation — the generation that experienced the Holocaust. His poetry offers us an exquisite and indispensable voice of the twentieth century. His little sister, murdered in Auschwitz, and his youngest son, who disappeared in South America, wander unceasingly through his poems. Beyond the personal losses, the devastation of the century informs all of his work. Textual rupture and fragmentation echo historical rupture and fragmentation. The wonder of Tuvia Ruebner is that, after a lifetime of loss and tragedies, he remains open to the possibility of happiness. This openheartedness accommodates the many paradoxes and conflicts of life and infuses his poetry with an enduring and encompassing compassion for the lost and for the living alike. 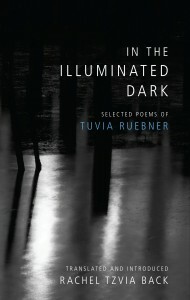 Hebrew Union College Press is delighted to offer two poems from In the Illuminated Dark: Selected Poems of Tuvia Ruebner as a preview of Ruebner’s poetry and Rachel Tzvia Back’s graceful translations. Available in May 2014, In the Illuminated Dark will be the first-ever bilingual edition of Ruebner’s work, published as he marks his 90th birthday, and among the first volumes published jointly by Hebrew Union College Press and the University of Pittsburgh Press.